The kids' loft area is nowhere NEAR any kind of shape for me to be photographing it for "After" pictures for you guys, Internet. 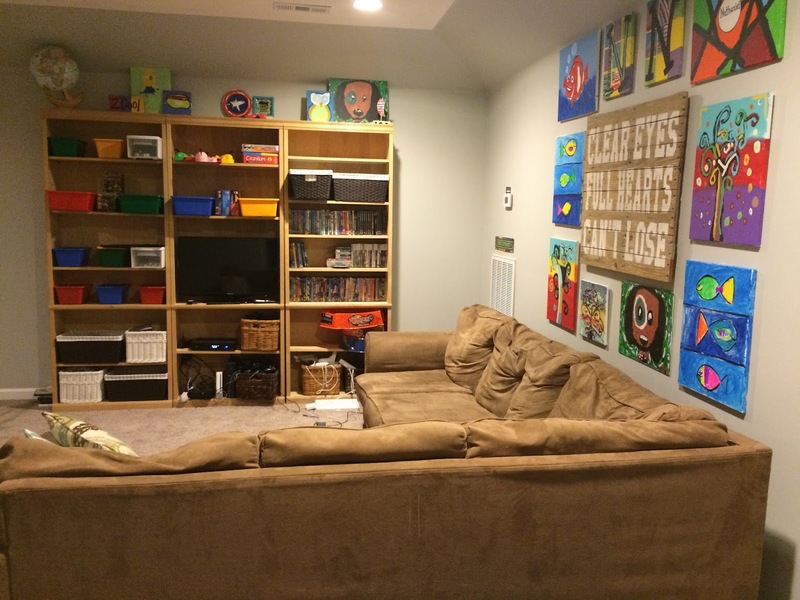 But there is one little project that we just finished that I thought I'd share with you: the gallery wall that includes our Clear Eyes pallet art and a bunch of the boys' own artwork. It's all hanging right above Big Brown (see why we bought a new sofa a couple of years ago? ), and if you look closely, you'll see a special little addition on the far left, right above the air-conditioning thingie. It's a piece of Minecraft "art" I bought off of etsy, and the boys LOVE it. I put it above the AC thingie so that it kind of looked like a Portal to the Minecraft world. I love having the boys' canvases on display where they can see them all the time (they did all of this art at Y camp over the past four summers), and of course my Friday Night Lights piece will always hold a special place in my heart. This room has a loooooonnnnng way to go, but we'll get there. One day. Trivia question: How many different types of baskets is it possible to have on one set of shelves? Answer: INFINITY.